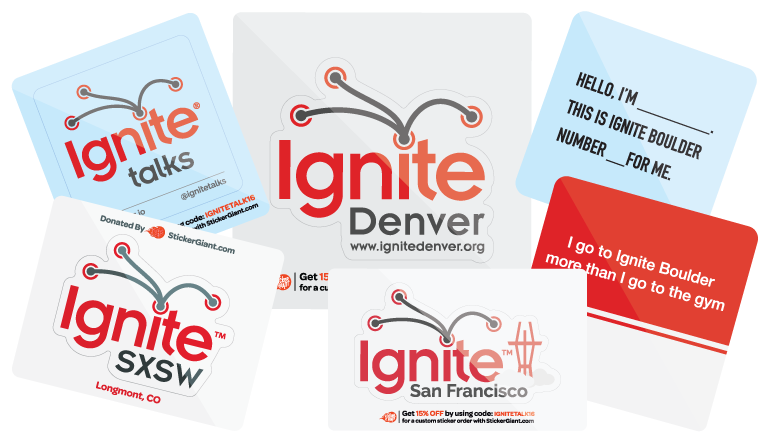 StickerGiant has partnered with Ignite Talks to provide in-kind sponsorships of custom stickers to Ignite evenst around the world. We make custom stickers fast and lining up with fast paced talks is a perfect fit for us. Stickers are a fun way to make an event last longer than just during the short window of time people experience it. It gives people a souvenier that will travel with them and share their experience with the world. We will consider all requests, but filling out the form does not automatically guarantee a sponsorship. As long as you are an official Ignite Talks event with enough notice time, we should be good to go. We prefer ten days notice before an event to get the custom stickers in hand in time. We can control the production time to make them fast, but shipping time is something to take into consideration. We typically offer sponsorships for custom sticker orders quantities between 250-1,000 stickers, depending on the attendee number. Fill out the form below to contact our team about if we can work together.